Dig deeper into the data and you find overwhelming support for a number of policy ideas, including at least 86 percent of respondents in favor of the following: (1) More training for police officers responding to active shootings, (2) background checks for all gun sales, (3) more security for allowing people into schools, and (4) programs to identify and manage students who may post a threat. 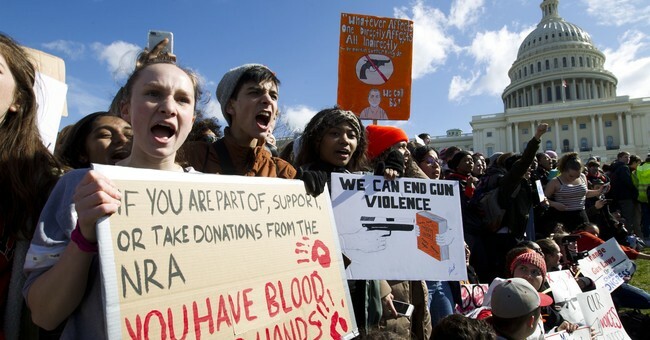 Majorities also support raising the gun-purchasing age from 18 to 21 (68 percent) and banning the sale of "semi-automatic weapons such as AR-15" (56 percent). The only proposal listed that polled below 50 percent was arming teachers (42 percent), though I suspect if the issue were framed as allowing some teachers to volunteer for training to be armed -- especially those with law enforcement or military backgrounds -- that number would jump. The Student, Teachers, and Officers Preventing School Violence Act of 2018, or the STOP School Violence Act, reauthorizes and amends the 2001-2009 bipartisan Secure Our Schools Act to offer Department of Justice grants to states to help our schools implement proven, evidence-based programs and technologies that STOP school violence before it happens. - Facilitate coordination between schools and local law enforcement. On the question of background checks, a bipartisan 'fix NICS' bill co-sponsored by Senators John Cornyn (R-TX) and Chris Murphy (D-CT) is designed to tighten up holes in the existing system -- which has failed on multiple occasions in recent years, with catastrophic and lethal consequences. Sen. Marco Rubio has also rolled out his support for a version of (apparently Trump-backed) gun violence restraining orders, which would help keep guns out of the hands of disturbed individuals, as flagged by those closest to them (with due process protections in place). This last piece is particularly relevant given the recent revelations that the Parkland killer had been identified as an emotionally-unbalanced threat several times, including a 2016 recommendation that he be involuntarily committed to a mental institution. When Rubio tweeted about that latter development, one particularly demagogic Parkland student activist accused the Senator of "shifting blame:"